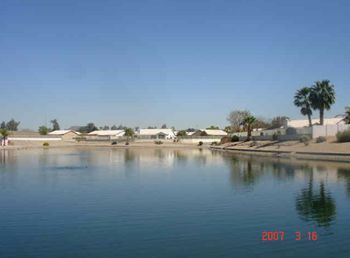 The Association owns and maintains 6 lakes. 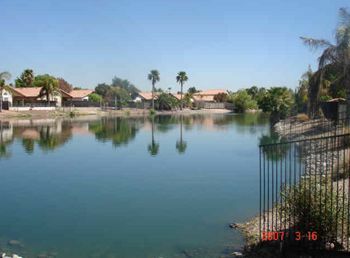 Four of the lakes are fenced and gated so there is no access permitted except for maintenance purposes, though they do afford lake views to about 115 homes. The other two of the lake areas, Lake 1A and 1B, are open for member enjoyment between 6AM and 10PM. 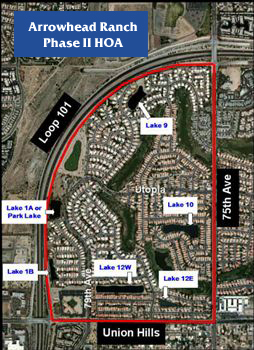 In 2007 the Board of Directors adopted rules closing these lake areas and posting them for "No Trespassing" between 10PM and 6AM due to vandalism as well as criminal and nepharious activities occuring there. The lakes have three primary purposes. Note that none of these purposes are recreational. No boating, swimming, fishing, feeding of birds, etc. is permitted on any of the lakes and Members are advised that the lakes are filled with effluent water. Streets and properties within the Association actually drain into our lakes and not into the city's stormwater system. 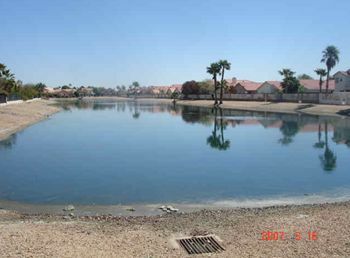 The lakes also serve to store runoff from our individual lots as most of our homes drain to the streets. That means that anything that runs off your lot or the street (fertilizer, oil, etc.) ends up in the lakes. 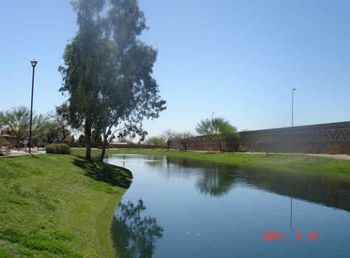 Retention/detention, such as that provided by our lakes, is a condition of development approval from both the City and Maricopa County. 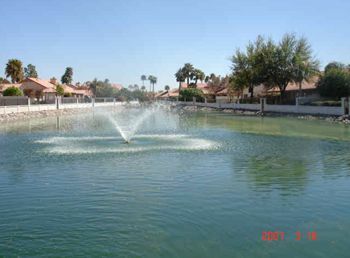 Again, our HOA is required by contract with Arrowhead Amenities and the City to use effluent water to irrigate our landscaped areas. 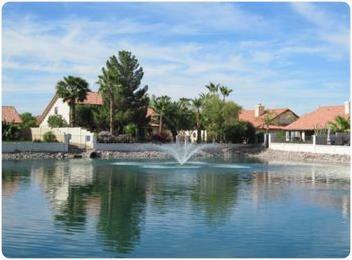 Lake maintenance is another major expenditure for HOA Members. We spend about $70,000 annually for lake maintenance including our contract with Water Resource Management for testing and chemical water treatments, fish stocking to control insects and nitrates, sediment reduction, pump and equipment maintenance, lake aeration and to repair vandalism. Maintaining water quality is a continual challenge given the debris and chemicals that drain into the lakes from the streets, bird nitrates and other contaminants, and the hot summer temperatures. 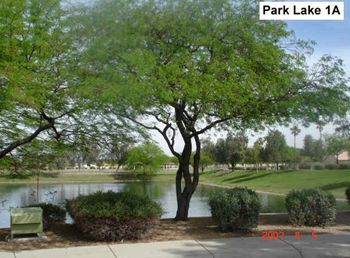 Our lakes are also threatened by a new algae appearing in Arizona waterways called Golden Algae that, unlike most other algae, flourishes in cooler winter weather. Algae blooms and oxygen crashes caused by chemical imbalances in the lakes can lead to fish kills as well as odor problems. Please do your part to help minimize maintenance costs - don't feed the birds as it attracts them to the lakes increasing nitrates, don't overwater after fertilizing, trim your landscaping so that it doesn't overhang the lake easement and don't backwash pools into the lakes. In 2006 a Sediment Study was performed on the lakes to evaluate the extent to which the storage capacity of our lakes has been reduced by sediment buildup on the lake bottoms. In summary, build up ranged from a low of about 7% to a high of 25% in a portion of Lake 12E. Typically a 25% reduction in storage capacity is the point at which consideration should be given to dredging. A major portion of our Reserve Fund is dedicated to the dredging that will inevitably be required to restore capacity. View the Executive Summary of the 2006 Sediment Study. View the Reserve Study.